It was a memorable weekend for two soon-to-be UNOH students as they were each surprised with a scholarship to attend the University of Northwestern Ohio. The best part? Their favorite Monster Jam drivers were the ones who presented the scholarship certificate to them during intermission of a Monster Jam event! 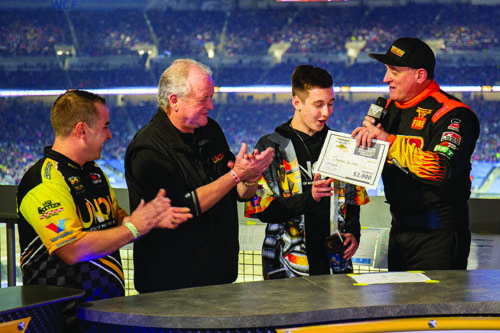 Thomas (Tommy) Varilone and Josh Krause were the first two lucky students who received scholarships at the Detroit, Michigan Monster Jam show. Tommy was one of the first prospective students to apply for the scholarship and called out Tom Meents as one of his favorite drivers in his application. Much to Tommy’s surprise, a UNOH admissions representative invited him to meet the University President, Dr. Jeffrey A. Jarvis during intermission of the Detroit event. During the live interview, Tom Meents walked on set and announced that Tommy was the first winner of a $2,000 scholarship to attend the University of Northwestern Ohio. The expression on his face was priceless! The next day, Josh Krause was introduced to his favorite driver, Ryan Anderson of Son-uva Digger, at intermission and was also surprised with his very own $2,000 scholarship to UNOH. Both students are planning to start classes at the University of Northwestern Ohio in August. Tommy will be majoring in High Performance Motorsports while Joshua will be dual majoring in Automotive Technology and High Performance Motorsports.